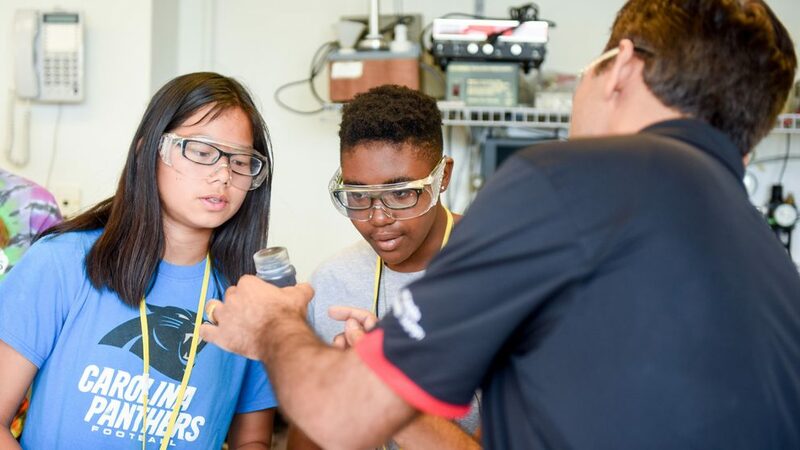 Each summer, the College of Engineering at NC State University offers rising 11th and 12th grade high school students the opportunity to experience engineering and get a glimpse of college life while staying on the NC State campus in Raleigh. The residential program allows students to explore a particular field of engineering in more depth while staying on campus in residential university housing. NC State offers rising 11th and 12th grade students the opportunity to explore engineering and college life at NC State through our residential HS programs. Students spend a week on campus, live in university housing, eat in the dining halls, meet diverse students from all over the globe and immerse themselves in a specific engineering workshop of their choosing. Students arrive early Sunday afternoon and are welcomed by staff with an orientation program and a camp-wide welcome dinner. Individual workshops run from 9 a.m. until 4 p.m., Monday through Thursday, with camp-wide activities in the afternoons and evenings. Friday morning, parents are invited to attend a showcase of student work, and the camp wraps up at noon on Friday. Students will spend their entire week at camp immersed in a particular engineering workshop. They may choose from a wide variety of topics, although note, not all topics are offered all weeks. Please note, we are unable to accommodate workshop changes once an admissions decision has been made. Students are encouraged to read each program description carefully so that they can choose ones that spark their interest. Providing additional workshop choices will increase the likelihood that a student is accepted as space is limited. This summer each applicant will only be admitted to a single workshop. Select a workshop tab to read the description. When is the workshop offered? In the emerging “green economy,” materials are being made out of renewable biomass instead of petrochemicals and minerals, water is being re-used and conserved efficiently and energy is being generated from renewable biofuels. Come experience the renewable future! This workshop combines engaging presentations with exciting hands-on laboratory activities and trips to local processing facilities. Campers will be asked to think critically and creatively to find solutions to the challenges facing a sustainable future. You may think of the paper industry as ordinary, but the industry is ready to to do some extraordinary things in changing to the economy of the future! Come and learn what your future will hold in the new bio-economy! Visit the website for more information about the Department of Forest Biomaterials (FB) in the College of Natural Resources. Have you ever tried 3D printing? If you want to learn more about it and get some hands-on experience you should attend the 3D printing summer camp. 3D printing, also known as additive manufacturing and rapid prototyping, is used for a wide variety of purposes today. In this summer camp, you will learn about all these exciting technologies, how they work and what you can use them for. The Center for Additive Manufacturing and Logistics houses a number of 3D printers for polymers, ceramics and metals that you will get a chance to see and use. During the week, we will mix presentations with labs and you will be working on a group project that will end with a competition on the last day. Visit the website for more information about the Edward P. Fitts Department of Industrial and Systems Engineering. Biological engineering is the combined application of engineering principles and biological sciences. From molecules and microbes to large ecosystems, biological engineers design solutions to real-world problems. Working with faculty and engineering students, participants will have a hands-on research experience using current technologies. This summer program is designed to give students an understanding of the diverse topics of biological engineering while allowing them to focus on the integration of two interest areas, machine systems and bioprocess engineering. Visit the website for more information about the Department of Biological and Agricultural Engineering. One of the major items used to measure the success of a culture or civilization involves the complexity of their buildings, structures, transportation systems and water management systems. These fundamental aspects of everyday life are the focus of the different disciplines contained within civil engineering. How do we efficiently design for natural occurrences such as floods, storms, hurricanes and earthquakes for our buildings and structures? How do we provide efficient transportation for people and products? How do we manage our water supply systems for both current and future needs? How do we build for today while preserving and protecting our environment for tomorrow? Summer camp at NC State in the Department of Civil, Construction, and Environmental Engineering will provide a variety of hands-on experiences and interactive tasks to serve as an introduction into these diverse topics that provide the basis of our civilization. Visit the website for more information about the Department of Civil, Construction, and Environmental Engineering. Students in the Ecological Engineering Summer Camp Program will learn about engineering design used to improve water and air quality and enhance the sustainability of our natural resources. Participants will experience several facets of environmental and ecological engineering, including measuring the impacts of stormwater treatment practices, assessing stream health and examining water flow through natural and man-made systems. This workshop includes a mix of indoor instruction and outdoor field experiences. Students should be ready to get wet and muddy tromping around in wetlands and streams! Like all fields of engineering, there are computer-aided aspects to ecological engineering. Students will learn and apply design and analysis skills. This workshop will include a day trip to the beach so that campers can experience ecological engineering applications in a coastal area. Materials are everywhere, and materials engineers are tasked with making stuff smarter, faster, stronger, cleaner, and most importantly, better! That’s why materials engineers are essential in many job fields: energy, medical devices, manufacturing, semiconductors, advanced textiles, aircraft and automotive and the list goes on. You will learn about the fundamental classes of materials such as metals, plastics, ceramics and composites in addition to cutting-edge research in nanomaterials, biomaterials, energy materials and microelectronics. Daily activities will involve hands-on experiments including melting glass, growing bismuth crystals, examining the micro- and nanoscale of objects with electron microscopes, fracturing samples in our mechanical testing lab and freezing objects with liquid nitrogen. 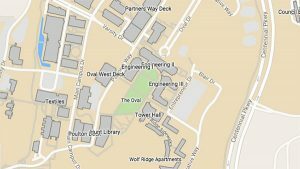 You will also have plenty of time to connect with fellow prospective engineers as you enjoy nano-ice cream breaks and our famous silly putty drop from the rooftop of NC State’s DH Hill Library. Visit the website for more information about the Department of Materials Science and Engineering. This program offers students the opportunity to learn about aeronautics, mechanical systems and electronic controls. Classroom work will include topics from airfoil and aircraft performance to structures and propulsion. Hands-on activities in the wind tunnel and building labs will reinforce concepts introduced during lectures. Experiences during the week will expose participants to the basic principles of mechanical and aerospace engineering. Working with faculty and current engineering students, each participant will apply these basic principles to construct a model airplane, which they will fly at a local field. Other activities will include field trips to local area airports and opportunities to use flight simulator programs. Visit the website for more information about the Department of Mechanical and Aerospace Engineering. “Scientists investigate that which already is; engineers create that which has never been.” Engineering is the first step towards helping to improve the world around you. Electrical and computer engineering (ECE) is a core component for most of today’s modern technology. Robotics is just one of the many fields in ECE where engineers design various components and integrate them together to create a device capable of accomplishing a task too dangerous or difficult for humans. Imagine an autonomous car, which can drive people with vision impairments and physical disabilities around. Imagine a rescue robot, which can enter a burning building and help locate and save people. In reality, robotics incorporates many of the fields electrical and computer engineers use in industry, including coding, motors, wireless communication, power generation and supply, and signal processing, allowing ideas to become reality. As a part of this workshop you will be given various ECE tools and equipment necessary to complete a real life task. You will learn to design systems with the elements and concepts of ECE that are used in several fields of industry. After learning these concepts, this workshop will place campers in reality-based dilemmas where they will be challenged to solve the problems by collaborating within a small team. Visit the website for more information about the Department of Electrical and Computer Engineering. What defines your success? As biomedical engineers, we strive to improve the quality of life for patients and those who care for them through innovating medical solutions. This program will provide a crash course in the process of innovating medial solutions through an experiential learning environment including problems faced by real medical professionals, need statement development, brainstorming, prototyping and performing an investor pitch. This multifaceted endeavor will encourage true collaboration across multiple disciplines including engineering, biology and medicine. Participants will join a team of varying interests and capabilities and dive deep into solving a real unmet medical need. No two projects will be the same and participants’ innovation will surprise both counselors and campers alike. Teams will work to develop a proof of concept prototype to impress investors and demonstrate the potential for improving patient health and quality of life. Visit the website for more information about the Joint UNC/NC State Department of Biomedical Engineering. You probably have a web-enabled smartphone that runs many apps. Odds are that you also have an idea for an app that you would like to write in order to make your life easier or more fun. A computer scientist has the skills and knowledge to make that great app idea into a reality! During this workshop, you will explore the skills necessary to describe, design, implement, and test an Android app for a smartphone or tablet. You will learn the fundamentals of programming and gain basic computer science skills for algorithm development and logic. You will work in teams to take an app idea from concept to reality! No prior programming experience is necessary. You will be using block-based programming and MIT’s App Inventor to create the apps. The main focus of the camp is to explore what Computer Science is all about! Visit this website for more information about the Department of Computer Science. Chemical and biomolecular engineers are sometimes called the “universal engineers” because they are extremely versatile and able to solve a wide range of technical problems. During this camp, students will get a big-picture view of the diverse applications of chemical and biomolecular engineering. Each day will focus on a different technology application: biotechnology, sustainability (energy and the environment) and entrepreneurship. In each focus area, students will interact with professors who will share cutting-edge research, participate in hands-on laboratory demonstrations and tour university facilities including the Biomanufacturing Training and Education Center. Visit the website for more information about the Department of Chemical and Biomolecular Engineering. X X X Look Up! Way Up! X X X There Must Be an App for That! Check-in is from 12:00pm to 2:00 p.m. on Sunday. We will arrange to pick up any campers arriving via airplane, bus or train. It is important that campers plan on arriving prior to 2:00 p.m. so that they can attend camp orientation and the welcome dinner. Parents are invited to attend closing ceremonies on Friday from 10 a.m. until noon. Checkout is by 1 p.m. We can arrange for transportation to airports, train stations or bus depots after that. Each day begins with a breakfast in the dining hall. Workshops start at 9 a.m. and continue until 4 p.m. with an hour for lunch. Afternoon and evening activities are scheduled each day. Campers have the opportunity to select activities that interest them most. Campers will be housed in a residence hall on campus, two to a room. No roommate requests can be accommodated. Residence counselors supervise campers during afternoon and evening activities and throughout the evening. The camper-to-counselor ratio is approximately 1:14. Students will eat breakfast, lunch and dinner in the dining halls. Dietary needs will be accommodated. Be sure to note any dietary needs in your online application. Camp workshops will be staffed by engineering faculty members and both undergraduate and graduate engineering students. Residence counselors will supervise the students for all evening activities. Financial Aid: A limited amount of financial aid may be available for families who demonstrate financial need. To be considered, a family must complete an online financial aid application. All students entering 11th or 12th grade in the Fall 2019 are welcome to apply. We are unable to make exceptions for younger students. Home-schooled students are also encouraged to apply, as are students from out of state and out of the country. Please note, applicants are only admitted to a single week-long workshop each summer. Applicants are required to enter information into our online application tool from their high school transcripts, displaying courses and grades up through and including Fall 2018. Applicants will also be required to write two short statements concerning their interest in attending camp and learning. PSAT, SAT or ACT scores are NOT required, but we will consider them if submitted. Admissions decisions will be based upon applicants’ academic achievements and demonstrated interest. Admitted students have typically earned A’s and B’s in math and science courses and have demonstrated a true desire to learn more about engineering. Acceptance into workshops is highly competitive. Because space is limited, you increase your likelihood of acceptance by indicating multiple workshop topics and week selections. The deadline to apply is April 5, 2019. You will be notified of acceptance on April 29, 2019.